Taro (pronounced /ˈtɑroʊ/) is a tropical plant grown primarily as a vegetable food for its edible corm, and secondarily as a leaf vegetable. It is considered a staple in oceanic cultures. It is believed to be one of the earliest cultivated plants. In its raw form the plant is toxic due to the presence of calcium oxalate, although the toxin is destroyed by cooking or can be removed by steeping taro roots in cold water overnight. Taro is closely related to Xanthosoma and Caladium, plants commonly grown as ornamentals, and like them it is sometimes loosely called elephant ear. The name “taro” is from Tahitian or other Polynesian languages; the plant is also called kalo (from Hawaiian), gabi in The Philippines, dalo in Fiji, seppankizhangu in Tamil, Arvee in Hindi and Karkalo in Nepali. Taro was probably first native to the lowland wetlands of Indonesia (talas). Estimates are that taro was in cultivation in wet tropical India before 5000 B.C., presumably coming from Malaysia, and from India further transported westward to ancient Egypt, where it was described by Greek and Roman historians as an important crop. Taro’s scientific name is Colocasia esculenta (synonym C. antiquorum); esculent is an English word taken directly from Latin and means edible. The Xanthosoma genus is closely related, and several common names including callaloo and coco or cocoyam are used to refer to either Taro or domesticated Xanthosoma species which share substantially the same uses. 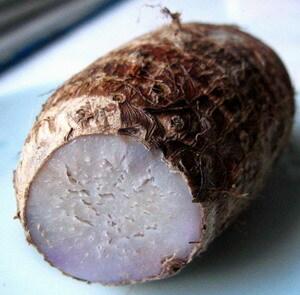 Taro may be distinguished as “taro cocoyam” or “old cocoyam”, with the term “new cocoyam” referring to species of Xanthosoma. In Kenya, taro root is referred to as arrow root, or by the Kikuyu or Kamba word ndŭma. In the Maldives this root or yam is referred as Ala. Varieties that grows in muddy ponds are called Olhu Ala . Olhu means a muddy pond. In South Africa, it referred to by the Zulu word amaDumbe or the anglicised madumbi. In some Caribbean countries, it is sometimes known as dasheen, a name said to be derived from the French de Chine which means from China and evokes the plant’s Asian origins. The leaves are used to make a soup popular in the West Indies, called callaloo soup. In Cyprus it is known as kolokassi, which is similar to the name the Romans used: colocasia, and it is known as “Qolqass” in Egypt. In Lebanon it is known as kilkass. Taro is also known as dalo In the Fijian Islands and in Japan as satoimo. Eddoe is another name for taro, although this one seems to be preferentially used to designate small corm varieties. The small round variety is peeled and boiled, sold either frozen, bagged in its own liquids, or canned. The plant is actually inedible when raw because of needle-shaped raphides (calcium oxalate) in the plant cells. Typical of leaf vegetables, taro leaves are rich in vitamins and minerals. They are a good source of thiamin, riboflavin, iron, phosphorus, and zinc, and a very good source of vitamin B6, vitamin C, niacin, potassium, copper, and manganese. Taro corms are very high in starch, and are a good source of dietary fiber. Oxalic acid may be present in the corm and especially in the leaf, and these foods should be eaten with milk or other foods rich in calcium so as to remove the risks posed by ingesting the oxalate ion, especially for people with kidney disorders, gout, or rheumatoid arthritis. In North India, it is called Arvi or Arbi. In Assamese it is called Kosu. In Bengali it is called Kochu(কচু). It is a very common dish and may be served with or without gravy. The leaves are rolled along with gram flour batter and then fried or steamed to make a dish called Patode which is finshed by tempering with red chiilies and carrom seeds. In himachal pardesh its roots is known as Ghandyaly in mandi distt. The dish called patrodu.patrodu pata+rodu. pata means the leaves of the Ghandyali and the dish which made by pata (leaves) is called patrodu. A tree-growing variety of taro is extensively used in the western coast of India to make patrade or patrada, literally “leaf-pancake”. These are either made like fritters, or are steamed and eaten. In the state of Maharashtra, it is called Alu in Marathi. The leaves, called ‘Alu che Paana’, are de-veined, rolled with a paste of gram flour, tamarind paste, red chilli powder, turmeric, coriander, asoefotida, salt and steamed. These can be cut into pieces, eaten as such or shallow fried and eaten as a snack known as alu chi wadi. ‘Alu chya panan chi patal bhaji’, a lentil and colocasia leaves curry is also popular. In the Indian state of Gujarat it is used to make patra, a dish with the leaves of the plant prepared with tamarind and other spices. Sindhis call it ‘Kachaloo’; They fry it, smash it and re-fry it to make a dish called ‘Took’ which compliments Sindhi Curry. In Kerala, a state in southern India, taro corms are known as Chembu-kizhangu. It is used as a staple food, as a side dish, or as a component in various side dishes. As a staple food it is steamed, and eaten with a chutney of green pepper and shallot onions. The leaves and stems of certain varieties of taro are used as a vegetable in Kerala. In other Indian states, Tamil Nadu & Andhra Pradesh, taro corms are known as Sivapan-kizhangu ‘chamagadda’ or in coastal Andhra districts as ‘Chaama dumpa’ in Telugu, and can be cooked in many ways, deep fried in oil for a side item with rice, or cooked in a tangy tamarind sauce with spices, onion and tomato. In Dakshin Kannada district in the state of Karnataka, Taro is used in morning breakfast dish as Patrode. In the Indian state of Uttarakhand and neighbouring Nepal, it is considered a health food with a variety of cooking styles. The most common style is boiling it in salty water in iron cooking pots until it becomes like porridge. Another style is to steam the young leaves called ‘gava’, sun-dry and then store it for later use. For another variety, the taro leaves and stems are used raw as an ingredient for pickles. The leaves and stems are mixed with black lentils and then dried as small balls called badi and used later on. The stems are also sun-dried and stored for later use. On one special day, women worship saptarshi (seven sages) and have rice with taro leaf vegetable only. Care must be taken to oil one’s hands before handling the leaves, as some leaves are acidic and cause scratching. The leaves are completely safe and delicious after cooking. Taro is grown in the hilly regions of [Nepal]. The modified stem (corm) of Taro is known as ‘Pindalu’ and petioles with leaves are known as ‘Karkalo’. Almost all parts are eaten by making different dishes. Large leaves of Taro are use as an alternative to umbrella when unexpected rain occurs. Boiled corm of Taro is commonly served with salt, spices and chillies. It is popular among hill people. Chopped and dried leaf petioles are used to make cake called ‘Maseura’. In Bangladesh it is known as Mookhi Kochu. It is cooked with small prawn into thick curry. Taro was used by the early Romans in much the same way the potato would later be used by Europeans. They called this root vegetable colocasia. Apicius mentions several methods for preparing taro. The text of Apicius seems to imply that the usual cooking method was to boil taro in water. Apicius suggests that a sauce be made from pepper, cumin, rue, vinegar, oil and liquamen to be served with chopped pieces of boiled taro. Apicius also mentions recipes in which pieces of taro are cooked along with meat or fowl, similar to the manner in which potatoes are now used in European meat dishes. After the fall of the Roman Empire, the use of taro gradually ceased in Europe. This was largely due to the decline of trade and commerce, as most of the taro used throughout the Roman Empire had been grown and exported from Egypt. Taro root is called ñame in Spanish and is largely cultivated in the Autonomous Community of the Canary Islands (Canary Islands, Spain). Taro is extensively used in South Asia. In Kerala, a state in southern India, it is used as a staple food, as a side dish, or as a component in various side dishes. As a staple food it is steamed, and eaten with a chutney of green pepper and shallot onions. The leaves and stems of certain varieties of taro are used as a vegetable in Kerala. A tree-growing variety of taro is extensively used in the western coast of India to make patrade or patrada, literally “leaf-pancake”. These are either made like fritters, or are steamed and eaten. In another Indian state, Andhra Pradesh, taro corms are known as ‘chamagadda’ or in coastal districts as ‘Chaama dumpa’ and can be cooked in many ways, deep fried in oil for a side item with rice, or cooked in a tangy tamarind sauce with spices, onion and tomato. In the Indian state of Gujarat it is used to make patra, a dish with the leaves of the plant prepared with tamarind and other spices. Ala was widely grown southern atolls, Addu, Fuvammulah, Huvadhu, and Haddhunmathi, . They considered it a stable food even after rice was introduced. Ala and Olhu Ala is still widely eaten all over maldives. It is cooked or steamed with salt to taste and eaten with grated coconut along with chili paste and fish soup. it is also prepared as a curry. The roots are sliced and fried to make chips and also used to prepare varieties of sweets. Taro (called yutou, 芋头 or yunai, 芋艿 in China; 芋頭, wuh táu? in Hong Kong) is commonly used within Chinese cuisine in a variety of styles, mainly as a flavor enhancing ingredient. It is commonly braised with pork or beef. It is used in the dim sum cuisine of southern China to make a small plated dish called taro dumpling, as well as a pan-fried dish called taro cake. It is also woven to form a seafood birdsnest. The taro cake is also a delicacy traditionally eaten during the Chinese New Year. In desserts it is used in tong sui, bubble tea, as a flavoring in ice cream and other deserts in the China(f. ex. Sweet Taro Pie). McDonald’s sells Taro flavored pies at their stores in China. Considered the staple starch of traditional Polynesian cuisine, taro is both a common and prestigious food item that was first introduced to the Polynesian islands by prehistoric seafarers of Southeast Asian derivation. The tuber itself is prepared in various methods including baking, steaming in earth ovens (umu or imu), boiling, and frying. The famous Hawaiian staple poi is made by mashing steamed taro roots with water. Taro also features in traditional desserts such as Samoan “fa’ausi,” which consists of grated, cooked taro mixed with coconut milk and brown sugar. The leaves of the taro plant also feature prominently in Polynesian cooking, especially as edible wrappings for dishes such as Hawaiian laulau, Fijian & Samoan “palusami” (wrapped coconut milk and onions), and Tongan “lupulu” (wrapped corned beef). Ceremonial presentations on occasion of chiefly rites or communal events (weddings, funerals, etc.) traditionally included ritual presentation of raw and cooked taro roots/plants. The Hawaiian laulau traditionally contains pork, fish, and lu’au (cooked taro leaf). The wrapping is with inedible ti leaves (Hawaiian: lau ki). The cooked taro leaf has the consistency of cooked spinach and would be unsuitable for use as a wrapping. Taro is consumed as a staple crop in West Africa, particularly in Nigeria and Cameroon. It is called cocoyam in Nigeria, Ghana and Anglophone Cameroon. It is called macabo in Francophone Cameroon. In Taiwan, supermarket varieties range from about the size and shape of a brussels sprout to longer, larger varieties the size of an adult male’s fist. Taro chips are often used as a potato-chip-like snack. Compared to potato chips, taro chips are harder and have a more assertive nutty flavor. They are generally made from upland taro because of their lower moisture. Excavated Japanese satoimo root (stems are cut before the plant is dug up): (1) Remaining stem from parent or seed satoimo, (2) Parent or seed satoimo, (3) Remaining stem from child satoimo, (4) Child satoimo, (5) Grandchild satoimoIn Japan, it is called satoimo (サトイモ, satoimo? ), (kanji: 里芋) “village potato”. The “child” (satoimo) and “grandchild” (satoimo), referring to the corms, are called imonoko (芋の子, imonoko?). Satoimo is has been propagated in Southeast Asia since the late Jōmon period. It was a regional staple food before rice became predominant. In South Korea, it is called toran (Korean: 토란: “egg from earth”), and the corm is stewed and the leaf stem is stir-fried. Taro roots can be used for medicinal purposes, particularly for treating insect bites. In Vietnam, where taro is called khoai môn, it is used as a filling in spring rolls, cakes, puddings, soups and other desserts. In Hawaii, taro is a traditional staple, as in many tropical areas of the world, and is the base for making poi. In Chinatowns, people often use taro in Chinese cuisine, though it is not consumed or popularized nearly as much as in Asian and Pacific nations. Since the late 20th century, taro chips have been available in many supermarkets and natural food stores. In the 1920s, dasheen, as it was known, was highly touted by the Secretary of the Florida Department of Agriculture as a valuable crop for growth in muck fields. Fellsmere, Florida, near the east coast, was a farming area deemed perfect for growing dasheen. It was used in place of potatoes and dried to make flour. Dasheen flour was said to make excellent pancakes when mixed with wheat flour. In areas with large Spanish speaking communities (especially from of the Spanish West Indies like Puerto Rico, Cuba, Domican Republic,etc..) it is called ñame. Another dish where taro finds common use in the Filipino kitchen is the Philippine national stew, called sinigang. This sour stew may be made with pork and beef, shrimp, or fish. Peeled and diced taro is a basic ingredient of pork sinigang. Finally, the third most common use of taro in the Filipino diet is in ginataan, literally meaning “cooked with coconut milk.” This form of dessert, where coconut milk and taro are combined along with indigenous ingredients such as sago and jackfruit, is shared throughout most Southeast Asian cuisines. Taro is called “dasheen”, with a smaller corm species being called “eddo” in the English speaking countries of the West Indies, and is cultivated and consumed as a staple crop in the region. In the Spanish speaking countries of the Spanish West Indies it is called ñame. Taro is grown in the south coast of Turkey, especially in Mersin and Antalya. It is boiled in a tomato sauce or cooked with meat, beans and chickpeas. In Cyprus, taro has been in use since the time of the Roman Empire. Today it is known as “kolokassi” which is similar to the name the Romans used: colocasia. It is usually stewed with celery (and sometimes meat) in a tomato sauce. Taro also grows on Ikaria island; Ikarians credit the taro for saving them from famine during World War II. In Lebanon, taro is known as “Kilkass” and is mainly grown along the Mediterranean coast. The leaves and stems are not consumed in Lebanon and the variety grown produces round to slightly oblong tubers that vary in size from a tennis ball to a small cantaloupe. Kilkass is a very popular winter dish in Lebanon and is prepared in 2 ways: “Kilkass with lentils” which is a stew flavored with crushed garlic and lemon juice and “kilkass in tahini” (tahini is a sesame seed paste). In Suriname the taro root is called “aroei” by the Indians and is commonly known as “chinese tayer”. The closely related Xanthosoma species is the base for the popular Surinamese dish pom. See You Tube /watch?v=OXxftlfdw-I for an awesome TARO SALAD! I was born and raised in KwaZulu Natal and my grandmother’s sister lived in the farmlands on the North Coast. She would always being some with her whenever she visited and I have always known this to be AMADUMBE. ….you copied and pasted the wikipedia article about taro. that’s….horrible. Just wondering is the Japanese taro leaves edible, and can it be prepared in the same manner as other taro leaves. This is the smaller taro called satiomo. You forgot to mention that it is a staple food in most of East Africa and West Africa from where it was taken to the Mediterranean! Big omission. Thank you for this information and thank you for including IsiZulu, it is hard to get these online. When one searches the online dictionary it actually does not give accurate translations sometimes.